If you’re considering online dating, you can’t really ignore Match.com. They offer a unique range of options for the “would be dater” – these include photo-video profiles, matching based on your own personality traits, daily matches to your inbox, as well as a whole range of sophisticated searches that let you discover people you may be compatible with. Match also spans the globe, with regional sites for various countries. I first came across match about 5 years ago when a friend of mine said she’d met someone on there and declared they were getting married! Back in those days (I’m talking 2005 by the way), online dating was still pretty much “out there” along with placing an ad in a lonely hearts column or going on a singles vacation, in other words it screamed “I’m desperate”. Well times have changed, you don’t need me to remind you how much time we all spend online and how much of our social lives revolve around our virtual personas. Online dating is now “almost” as accepted as being on Facebook. With Match being one of the biggest players out there, I thought I’d give you my own thoughts about it, how it works, how much it costs, and most importantly what kind of success you can expect there. First things first, a warning: online dating sites are not the sure fire bet to find someone quickly that they once were. I realize this may disappoint many people. Well this seems a contradiction, when more people than ever are using the net as a means to meet. But as anything goes mainstream, people simply have more choice available to them and don’t have to settle for the less than ideal partner. In other words it reflects real life more – and you don’t need me to tell you that finding a partner in-real-life can be a harsh ordeal. So, you’re prepared for some hard knocks, and looking forward to meeting your next Mr./Mrs. Right. What next? Well the first thing is to plan your profile. It’s incredible the number of people I know personally who’ve had half hearted attempts at online dating, putting up a bland profile (usually with a low quality taken on their mobile or no photo at all) and scant description. They then bemoan the fact that nobody was interested in them. Likewise unless you’re’ Brad Pitt or Angelina Jolie, putting up a photo with a one liner saying something like “message me” probably isn’t going to work either. Keep in mind your profile is literally one among millions. You need to make it stand out by being catchy and engaging. If you are even half serious about meeting someone, I can’t stress enough how important it is to spend time creating a good quality profile, that accurately describes yourself and is interesting enough that people won’t just click next. Match lets you put up your profile with a free account. You simply register as a new user, and follow all of the steps to create your profile. Now unlike Plenty of Fish, Match is a pay site, meaning access to a lot of areas of the site won’t be available to you unless you upgrade. So, is it worth paying for? There are certain pros, and cons with pays sites verses free sites, and I’d definitely recommend reading them, to decide which is best for you. I’m certainly not recommending one is better than the other, I’ve known many people who’ve had success on both. So, now your profile is up, it could be featured for a while as a new member so if you’ve put in some effort, this could be paying off now with a few emails, winks and being faved. If not, review your profile and make changes if necessary. Don’t be afraid to get someone who knows you well to glance over it; you may get some useful advice. I had one friend show me her profile and what surprised me was how she’d completely “under sold” herself. Of course many others do the reverse and go so overboard telling you how great they are you wonder why the hell are they still single? One premium feature that Match offers is a profile writing service! Don’t have the time to create a profile? Their professional writers will do it for you – for a hefty fee of course. Now you don’t have to just sit and look pretty, you can (and should) be proactive. There’s no stigma about females making the first move, though girls, you should be aware that men are regularly approached by scammers, masquerading as attractive females (more so on free sites but also on match). Model photos, broken English and requesting money are often tell-tale clues that raise red flags. Ironically, if you have a model like “photo shopped” portrait, this can work against you. Just be sure to write a genuine message, point out something about their profile or photo that lets them see this is not a mass spam email and you are a real person. Likewise, scammers will often target women posing as soldiers based overseas, doctors, or a recently bereaved. As in real life, being savvy to the ways of scammers is essential to success as well as remaining safe. Dating sites have come a long way since simple searches based on gender and location throwing up a few random matches. Match has invested heavily in a number of state of the art tools to help you locate people based on core personality traits, hobbies and interests, appearance, and what you/they are looking for. One of my favorites is called reverse matches. This is a good one to use if you’ve done a few basic searches, and nothing turned up. Reverse match does exactly what it says. It shows you people who are looking for someone like you. Personally, what I have found is that for this to work to any degree you need to make sure your personality profile is complete and brutally honest. When it does work the reverse match can throw up some unexpected surprises that you hadn’t considered. The basic searches just work on one side of the love equation, while the reverse match can really bring together those unexpected ones, like the shy geek and the 6-foot glamour model. Match’s own personality test, which is by the way optional, only takes around 20-minutes to complete. Again (unlike the 2-hour mega test found on eHarmony), having this done shows people you are serious and not a scammer. If you’ve paid the fee, I’d definitely recommend doing this. As I said, the personality section is optional, and is certainly not essential if you are just looking for chat and friends. Match’s sister site, Chemistry.com focuses on matching people purely based on their personality traits, however if you are thinking of going down this route, I’d recommend eHarmony purely for the fact that I’ve personally found their matches to be better, as well as having a broader user base than Chemistry. If you opt in for emails you will most likely receive a few match suggestions each day. These will also be displayed when you log into the site. On reviewing your matches, you can say yes, no or maybe to each. Saying yes or maybe means that that person will be notified that you are potentially interested in them. Like the reverse match, daily matches is only effective if you’ve completed your profile sections including personal otherwise what’s thrown up will be random. Like eHarmony, Match lets you set deal breakers – this lets them refine the match suggestions which will be sent to you. Many people go “hog wild” setting deal breakers, such as physical height, smoking habits and so on. But to be honest, I prefer not to set them, I’d really prefer to see all potential matches and then decide after seeing their profile – you never know you could be missing some real gems by setting too rigid deal breakers. So, how much does it all cost? a basic 1 month subscription will set you back around $39, and most people spend around 6 months on there before meeting someone. Full list here, there is something called the love guarantee, in which they’ll give you an extra if you don’t meet someone in 6months. But to be honest, there are so many conditions attached I wouldn’t rely on this too much. As I’ve said earlier, if it’s worth it really depends on your own circumstances and goals. Though if you are considering using a pay site, I’d say Match is probably your best choice right now (unless you want some sort of niche), purely in terms of their user base and features offered. I am seeking for a serious relationship. And I am ready to spend the money. All I want is a serious relationship for life. If I find my match I would marry him. I joined Match.com about a year ago, after traditional dating just wasn’t working out for me. I also joined a few other dating sites at the same time, but Match.com ended up being my second choice, as nothing beats eHarmony (at least in my opinion). As the comment above me outlined, it is quite pricey per month which I think could be a deterrent for many people- but when you think about it, if someone really is “serious” about finding someone, what’s $40 a month? I did like their personality test (which you get when you pay the monthly fee) and I do feel like it matched me well based on the criteria that it took into account (it’s obviously not as detailed as the eHarmony test, but asks enough to generally match you with the right kind of people). I also really liked the “reverse match” feature as it gave you the ability to look for people who were looking for someone like you (a little bit of an ego boost!). All and all I would say that if you’re going to spend money, eHarmony is the place to spend it- but Match.com isn’t a bad second place in my books. 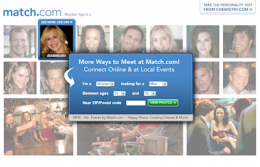 From what I have seen of Match.com is that even though it is one of the biggest dating site giants out there, it just isn’t as good as eHarmony, or Plenty of Fish. Perhaps this is because it has very little features that come with the free profile and in my opinion it seems to be a waste of time if you’re just going to throw up a free profile and not be able to use 80% of the features. Furthermore, a $39 monthly fee, just to gain access to their features… with this I would rather take my chances at finding someone on eHarmony (which does have pay features as well), then paying out that amount each month. 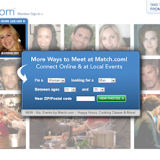 The only thing that seems to be going for Match is that it does have some unique tools that you don’t really see on any of the other big dating sites, which can be extremely useful in finding compatible people. I think adding in the service of having the opportunity for your profile to be professionally written for you is a nice bonus, other then that you have to pay for it. I would probably ask a friend or family member for help before I pay to have a profile written about me. Mind you for those who are just not word savvy or computer savvy, this might be a plus if they have the money to spend.